Abang Johari and Juma’ani, flanked by Riot (right) and Manyin listening to Primary 6 pupils from SJK Chung Hua Serian explaining their engineering project in English prior to the launch of SELPI in Serian. SERIAN: Sarawakians are encouraged to have a strong command of both English and Bahasa Malaysia. Chief Minister Datuk Patinggi Abang Johari Tun Openg said English proficiency is very important in this era of industrial revolution. “Most of the technological devices today are produced and sold together with a manual in English. “Our market is now global and it is a result of connectivity where the world is integrated. Our economy now is also integrated with the world and you must be able to connect the world with the language that they can understand, the buyer and the seller can understand. 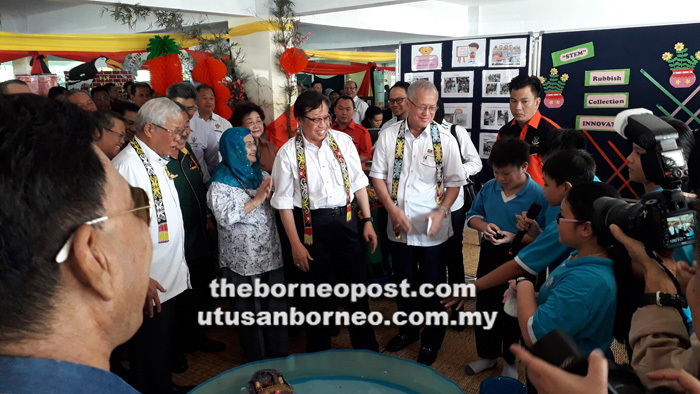 “In this case, whether you like it or not, English is the lingua franca, even the technological lingua franca,” he said at the launch of Serian English Language Proficiency Initiatives (SELPI) at Kampung Pichin here yesterday. Abang Johari stressed that studying English did not mean that Sarawakians are not patriotic, adding that Bahasa Malaysia remains as a national language. BM, he added, should not become a hindrance for people, especially Sarawakians, to know other languages. “If we can have good command of dual language English and BM, I think our future is very bright. “And then if you have the third language, for instance Mandarin, then you can send your products to China, which has 1.3 billion people. “Without knowing Mandarin it is quite difficult also to send our products to China,” he said. Abang Johari noted that when Sarawak launched its digital economy it has to be driven together with its command of English language, which is universal. “That is also why the Minister of Education, Science and Technological Research Dato’ Sri Manyin and his team are promoting this language,” he said. Among those present to welcome the Chief Minister and wife Datin Amar Datuk Juma’ani Tun Tuanku Bujang to the event were Manyin and Minister of Human Resources Datuk Seri Richard Riot Jaem.